Mary Wollstonecraft (circa 1797) by John Opie. Mary Wollstonecraft (April 27, 1759 – September 10, 1797) was a British intellectual, writer, philosopher, and early feminist. She wrote several novels, essays, and children's books, but is best known for her A Vindication of the Rights of Men (1790), a criticism of Edmund Burke's pamphlet on the French Revolution, and A Vindication of the Rights of Woman (1792), regarded as her most important work. Wollstonecraft argued that all men and women had equal natural rights, and that an ideal society could not be realized until everyone was free to exercise those rights. False gender distinctions corrupted the relationships between men and women, and prevented either from developing true virtue. Virtue, which consisted of imitating God, could only be cultivated when natural faculties common to both men and women, such as reason and passion, were allowed to develop unimpeded. She spoke out against the situation of women in the eighteenth century, declaring that they were educated to be submissive to men and to value physical attractiveness over character and intelligence. Wollstonecraft was married to the philosopher William Godwin, a prominent atheist and one of the forefathers of the anarchist movement, and was the mother of Mary Shelley, the author of Frankenstein. Mary Wollstonecraft was born April 27, 1759, the second child of seven, and the eldest daughter of Edward and Elizabeth Wollstonecraft. Her grandfather was a wealthy silk merchant who left ten thousand pounds to her father, but Mary's father tried to distance himself from the trade and set up as a gentleman farmer first in Essex, and then near Beverley in Yorkshire. In less than four years, Edward's farm in Essex failed. Edward moved his family five more times, across England and Wales, to poorer and more remote farms, eventually squandering his inheritance. He developed a drinking problem and began to verbally, and perhaps even physically, abuse Mary's mother; Mary tried to shield her mother from Edward's aggression by sleeping nights on the landing near her mother's bedroom door. Mary assumed a mother's role towards her siblings, especially her two sisters Eliza and Everina. In 1768, the Wollstonecrafts moved to a farm outside of Beverley, where Mary attended a local day-school for girls. The school taught a curriculum intended to make girls marriageable and ladylike; French, needlework, music, dancing, writing, and possibly some botany and accounts. At home and with friends Mary read books, magazines and newspapers, and learned to consider the social issues troubling Great Britain. In Beverley, she attended the lectures of John Arden on experimental science; he also taught her, along with his daughter Jane Arden, how to argue philosophical problems. When Mary was fifteen, the Wollstonecrafts left Beverley for Hoxton, London. Mary continued to educate herself through reading books and periodicals available in libraries and coffee shops, and by attending discussion groups and public lectures. Her next-door neighbors, the Reverend Mr. Clare and his wife, encouraged her to read proper books, and through Mrs. Clare, Mary met Fanny Blood, a woman two years her senior, who became Wollstonecraft's close friend for the following ten years. Fanny inspired Mary to consider leaving her unhappy family life and obtaining employment. Mary prepared to leave, but her mother begged her to stay and allowed her to live near Fanny, lodging with an unusual couple, Thomas Taylor "the Platonist" and his wife. Mary became friends with them and began to read Plato, which stimulated the development of her religious feeling. After her mother’s death in 1782, Mary moved in with Fanny and her family, and worked to support them as well as her younger sisters. In 1783, Mary helped her sister Elizabeth Wollstonecraft Bishop to escape an unhappy marriage by hiding her until a legal separation was arranged. Elizabeth left her home and her newborn baby, and for the rest of her life supported herself as a teacher and governess. Early in 1784, Wollstonecraft, her two sisters, and Fanny Blood set up a school for girls in Newington Green, a village just north of London. The following year, Fanny Blood left the school and sailed to Lisbon to marry. Later Mary herself traveled to Portugal to assist Fanny in childbirth; tragically, Fanny died. In 1786 Mary was obliged to close the school because of financial problems that had mounted during her absence. She became a governess to three of Lady Kingsborough's daughters in Ireland, but left the position after only a year. Her experiences as a teacher helped to formulate her ideas for her later works. Mary settled in George Street, London, and decided to become "the first of a new genus," a female intellectual. To raise money, Mary began to write Thoughts on the Education of Daughters: With Reflections on Female Conduct, in the More Important Duties of Life; the work was published in 1787 by Joseph Johnson, a publisher of radical texts. The book earned her ten guineas, which she gave to the Blood family. She also published Mary, A Fiction, a work that she had been composing while a governess for the Kings, and worked as a reader and translator for Joseph Johnson, beginning her career as a published writer. In 1788, Joseph Johnson published Wollstonecraft's Original Stories from Real Life and Of the Importance of Religious Opinions. She became acquainted with and accepted among London intellectuals and radical thinkers. When Johnson and Thomas Christie launched the Analytical Review in 1788, Mary became a regular contributor of articles and reviews. In 1790, Mary published Young Grandison, a translation of Maria van de Werken de Cambon's adaptation of the novel by Samuel Richardson, followed by a translation of Elements of Morality by Christian Gotthilf Salzmann. In November of that year, she anonymously published A Vindication of the Rights of Men, the first response to Edmund Burke's Reflections on the Revolution in France. She was angry that Burke, who had once defended the American colonies so eloquently, should now attack the revolution in France and criticize Richard Price, a close friend from her Newington days. One month later, she published the second edition bearing her name, establishing her reputation as a social reformer. One year later, in 1791, she published a second edition of Original Stories, and started to write A Vindication of the Rights of Woman; she also met her future husband, the philosopher William Godwin, through Joseph Johnson in November of that year. In January 1792, Mary published A Vindication of the Rights of Woman, which received several favorable reviews; she published a second edition later that year. In 1793, while gathering material for An Historical and Moral View of the French Revolution (1794) in France, Mary met Captain Gilbert Imlay, an American timber merchant, (author of The Western Territory of North America,1792), and had an affair with him. She registered as his common-law wife at the American Embassy in Paris in order to claim the protection of United States citizenship during the French Revolution, and in 1794, gave birth to Fanny Imlay at Le Havre. In 1795, accompanied only by her two-year-old daughter and a maid, Wollstonecraft traveled through Scandinavia on behalf of Gilbert Imlay. She learned of Imlay's infidelity and attempted suicide twice. In 1796, she published Letters Written during a Short Residence in Sweden, Norway, and Denmark. She met William Godwin again in April of 1796; he had read her Letters, saying that "if ever there was a book calculated to make a man in love with its author, this appears to me to be the book." They began a relationship but maintained separate living quarters so that they could each concentrate on their writing careers. Both Godwin and Wollstonecraft were philosophically opposed to marriage as a form of tyranny, because of laws which gave rights to the husband and took them away from the wife. After Mary became pregnant, they married in March of 1797. Wollstonecraft died on September 10, 1797, of puerperal fever eight days after the birth of her second daughter, Mary. She was buried at Old Saint Pancras Churchyard and there is a memorial to her there, though both her and Godwin's remains were later moved to Bournemouth where Mary Shelley is interred. William Godwin raised their daughter Mary together with Wollstonecraft’s daughter Fanny; Mary later eloped with the poet Percy Bysshe Shelley and became the author of Frankenstein. Mary Wollstonecraft was both and idealist and an optimist who believed in the possibility of a social order in which every individual is free of the shackles of false authority. She lived and wrote during the period of the American and French Revolutions, at a time when great social changes were taking place in England. Her philosophy was expressed not only in her writing, but in her personal life. In spite of difficult family circumstances during her childhood and a lack of formal education, she made her way as a published writer and established her reputation among the radical intellectuals of her day. She is generally recognized as a feminist, but her deepest concern was for the rights and freedom of all human beings. Wollstonecraft’s first book, Thoughts on the Education of Daughters: With Reflections on Female Conduct, in the More Important Duties of Life (1787) was inspired by her experiences as a governess and as a teacher at the school for girls in Newington Green. She perceived that her students had already been educated, by their parents and society, to suppress their natural intelligence and accept a role as second-class citizens. She also wrote several works of fiction, including Original Stories and Mary, A Fiction; numerous articles of the Analytical Review; and An Historical and Moral View of the French Revolution (1794), criticizing the violence which she observed in France. Her most famous work, A Vindication of the Rights of Woman, was written shortly after she published A Vindication of the Rights of Man. These two books, written with passion and intensity of expression, spoke out against the failure of society to cultivate “true virtue” in men and women. In her literary work, as in her philosophy, Wollstonecraft struggled to break conventional forms, and to communicate her ideas to different audiences. Her most experimental works are A Short Residence in Sweden, and her unfinished Maria, or The Wrongs of Woman. A Short Residence in Sweden is based on a series of personal letters written to her unfaithful lover, Gilbert Imlay, during a four-month journey through Scandinavia; it combines commentary on travel and politics with personal reflections on love. Maria, or The Wrongs of Woman, intended as a sequel to Vindication of the Rights of Woman, used the form of popular fiction to portray a society in which women of all classes were abused and excluded. Wollstonecraft further declared that men would never be truly free until they changed their atttitude towards women and valued them for qualities of fortitude, justice, wisdom and honesty instead of for physical beauty and subservience. A situation in which one element of society dominated and another element was subservient impeded the development of virtue in all members of that society, whether the inequality existed between the sexes or between social classes. Vindication of the Rights of Woman, expanded on these ideas and addressed the situation of women in the eighteenth century. 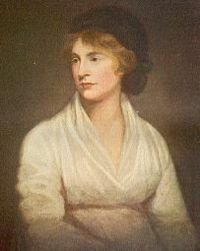 Wollstonecraft insisted that human rights, being based on reason, have no sexual basis and belong to men and women equally; but she recognized that men and women had different natures, saying, “whatever tends to incapacitate the maternal character, takes woman out of her sphere.” She examined the social origins of sexual inequality and deplored the lack of educational opportunities for women. She exposed the myth the women were helpless, charming ornaments of a household, saying that society had bred “gentle domestic brutes” who were foolish and overly sentimental due to ignorance, and often tyrants to their children and servants because of the frustrations arising from their confined existence. She criticized the false values of society, which required that women cultivate their physical beauty and submissiveness rather than their intellect and character, and pointed out that the relations between men and women were corrupted by artificial distinctions between genders. True virtue in both men and women consisted in the imitation of God, and could only be cultivated through the unimpeded development of natural faculties common to both sexes, including reason and passion. Political justice could only be realized based on the virtue of the individual members of society, and individual virtue could only advance under a just political system. In 1798, soon after her death, her husband William Godwin published Wollstonecraft's Posthumous Works which included Godwin's own biography, Memoirs of the Author of "A Vindication of the Rights of Woman." Though he wrote with honesty and love, conservative critics took advantage of the details of her troubled love relationships and financial difficulties to discredit her work. Few contemporary writers made reference to her books, and the significance of her ideas was overshadowed until much later. Macdonald, D.L. and Kathleen Scherf (ed.). The Vindications: The Rights of Men and The Rights of Woman. By Mary Wollstonecraft. Broadview Press, 1997. Todd, Janet and Marilyn Butler. The Complete Works of Mary Wollstonecraft. 7 vols. New York: New York University Press, 1989. Todd, Janet. The Complete Letters of Mary Wollstonecraft. New York: Columbia University Press, 2004. Todd, Janet. The Political Writings of Mary Wollstonecraft. Toronto: University of Toronto Press, 1993. Todd, Janet. Mary Wollstonecraft: Mary, A Fiction. New York: Schocken Books, 1977. Todd, Janet. A Wollstonecraft Anthology. New York: Columbia University Press, 1990. Todd, Janet. Mary Wollstonecraft: Historical and Moral View of the Origin and Progress of the French Revolution. New York: Scholars' Facsimiles and Reprints, 1975. Falco, Maria J. (ed.). Feminist Interpretations of Mary Wollstonecraft. University Park: Penn State Press, 1996. Gordon, Lyndall. Mary Wollstonecraft. Little Brown, 2005. Gubar, Susan. Critical Condition: Feminism at the Turn of the Century. New York: Columbia University Press, 2000. Jump, Harriet. Mary Wollstonecraft: Writer. New York: Harvester Wheatsheaf, 1994. Kelly, Gary. Revolutionary Feminism: The Mind and Career of Mary Wollstonecraft. New York: St. Martin's, 1992. Poovey, Mary. The Proper Lady and the Woman Writer: Ideology as Style in the Works of Mary Wollstonecraft, Mary Shelley, and Jane Austen. Chicago & London: University of Chicago Press, 1984. Tomalin, Claire. The Life and Death of May Wollstonecraft. Penguin, 1992. Wollstonecraft, Mary. The Norton Anthology: Theory and Criticism. Ed. Vincent B. Leitch, William E. Cain, Laurie Fink, Barbara Johnson, John McGowan, and Jeffery J. Williams. New York: W.W. Norton & Company, Inc., 2001. 582-593. This page was last modified on 30 August 2018, at 14:46.